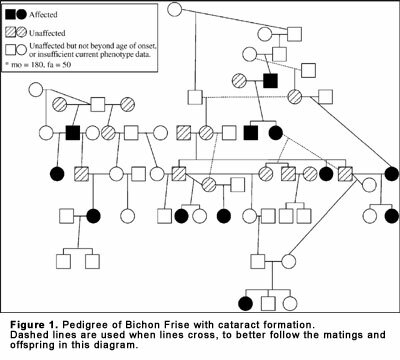 Objective: To determine the mode of inheritance of cataract formation in the Bichon Frise. Materials: Thirty-six closely related Bichon Frise dogs in a pedigree of 61 dogs were examined using slit-lamp biomicroscopy and indirect ophthalmoscopy over a period of 10 years. Results: Of the 61 related dogs, 36 were examined repeatedly. Twelve cataractous dogs were diagnosed (three males and nine females). Cataractous dogs resulted from matings between unaffected parents, and when one parent was cataractous and the other parent was unaffected. Age at onset of cataract formation ranged from 18 to 160 months. Available information suggests that the cataracts are inherited as an autosomal recessive trait. Conclusion: Cataracts appear inherited in the Bichon Frise as an autosomal recessive trait. Additional cataract × cataract matings are necessary to confirm the autosomal recessive heredity. Most clinical studies of inherited primary cataracts in dogs have reported limited numbers of dogs. 1The mode of inheritance in these studies was often proposed but not validated because of insufficient numbers of dogs and specific types of matings. In addition, most inherited canine cataracts of dogs affect the adult animal, and development of the cataracts often spans several years requiring multiple eye examinations. Hence these studies often must span a decade or more. We reported possible inherited cataracts in the Bichon Frise in 1996 and in 2003.2,3 The 1996 report involved 1202 dogs in the Canine Eye Registry Foundation database (CERF: 1991–96), 27 Bichon Frise in the University of Florida Veterinary Medical Teaching Hospital (UF-VMTH) medical records, and 230 dogs examined at special Bichon Frise eye clinics (KNG and SEA) and patient information provided by cooperating American College of Veterinary Ophthalmologists Diplomates. The 2003 report included CERF data with 406 dogs with cataracts in a population of 8222; 406 dogs with cataracts in a population of 1407 patients presented to veterinary medical teaching hospitals (Veterinary Medical Data Base; VMDB); 57 cataractous Bichon Frise in the UF-VMTH, and 391 dogs examined at special clinics (223 dogs with cataracts). Cataract formation in this breed is also associated with pre- and postoperative retinal detachments, and presents a special risk factor in cataract surgery in the breed.3,4 In the 2003 report, retinal detachments were diagnosed in 33% of the UF-VMTH patients, and 13% of the VMDB patients. The high risks of retinal detachments, cataract formation and lens-induced uveitis have resulted in the recommendation to veterinary ophthalmologists that Bichon Frise dogs presented for cataract surgery undergo retinopexy before or at the time of cataract surgery. Cataractous Bichon Frise presented to one practice specializing in retinal detachment surgeries had a prevalence of 50% retinal detachments; after retinopexy prevalence of retinal detachments was reduced to 10%.4 Hence, elimination of the cataractous trait in this breed may be the best solution because cataract surgery is not always successful nor possible. In this report, a family of cataractous and normal Bichon Frise dogs is presented with clinical examinations over 10 years to document the mode of inheritance. There are 61 dogs in the pedigree, and the eyes of 36 dogs were examined repeatedly (Fig. 1). There were 12 cataractous dogs, and all resulted from mating of one cataractous parent and one clear lens parent or two unaffected parents. Of the 12 cataractous animals, 9 were females and 3 were males. The age at onset of cataracts for these 12 animals ranged from 18 to 160 months. Unaffected animals in the most recent generation of dogs are too young to absolutely rule out this cataractous trait. The pedigree strongly supports our hypothesis that cataracts are inherited in the Bichon Frise as an autosomal recessive trait. This is by far the best fit for mode of inheritance given that both genders are affected, some offspring from unaffected parents have developed cataracts, and other affected dogs arise from a cataractous × unaffected mating. Furthermore, the consanguinity present also fits the hypothesis of unaffected parents being carriers of the same mutation. This is also highly consistent with the small numbers of dogs used to establish the breed in the USA (n= 9) 5 and the increasing frequency of this trait over time. However, the lack of cataractous × cataractous matings and limited number of dogs can not completely validate this hypothesis at this time. Primary breed-related cataracts are common in purebred dogs, and ~60 breeds of dogs are reported with primary cataracts above the baseline of 1.6% prevalence of the mixedbreed/hybrid canine population.6 In the veterinary medical teaching hospitals in North America primary cataracts have occurred in nearly 40 000 dogs and have increased in frequency from 0.95% (1963–1774) to 2.42% (1994–2003). Nearly 160 breeds of dogs have been diagnosed with primary cataracts in this recent report.6 Clinical studies involving inherited cataracts in dogs have many challenges, including random matings, long periods and repeated eye examinations, limited funding, continued breeder cooperation and interest, and uncontrolled geographic distribution of animals. Affected × affected matings are unusual and unintentional, and usually result before cataract formation is detected in both dogs. The current literature on inherited cataracts in dogs consists of almost all clinical studies, and indicates that most pedigrees were incomplete and limited numbers of dogs were available. As a result, the mode of inheritance was usually proposed but could not be validated statistically except in the Miniature Schnauzer with inherited autosomal recessive congenital cataracts. In the clinical report by Rubin et al. there were 12 litters from cataractous × unaffected matings, and two litters of two puppies each from cataractous × cataractous patients.7 The subsequent laboratory investigation of the Miniature Schnauzer involved cataractous × cataractous matings (18 matings; 87 cataractous pups), cataractous × normal (2 matings; 11 normal dogs); and cataractous × carrier matings (18 matings; 39 cataractous pups and 42 normal lens pups).7 Our careful long-term analysis in this report strongly supports the presence of an autosomal recessive form of cataract in the Bichon Frise. Support was provided, in part, by the Bichon Frise Club of America, the American Kennel Club-Canine Health Foundation, the Hayward Foundation, and the Gwathmey-Adams Laboratory for Vision Research, University of Florida. Davidson MG, Nelms SR. Diseases of the lens and cataract formation. In: Veterinary Ophthalmology, 3rd edn. (ed. Gelatt KN) Williams & Wilkins Lippincott, Philadelphia, 1999; 797–825. Proceedings of the American College of Veterinary Ophthalmologists (Abstract), 1996; 88–89. Gelatt KN, Wallace MR, Andrew SE et al. Cataracts in the Bichon Frise. Veterinary Ophthalmology 2003; 6: 3–9. with cataract. Veterinary Ophthalmology 2004; 7: 307–310. Stubbs BB. The Complete Bichon Frise . Howell, New York, 1990; 1–17. Gelatt KN, MacKay EO. Prevalence of primary breed-related cataracts in the dog in North America. Veterinary Ophthalmology 2005; 8: in press. Rubin LF, Koch SA, Huber RJ. Hereditary cataracts in Miniature Schnauzers. Journal of the American Veterinary Medical Association 1969; 154: 1456–1458. Miniature Schnauzer. American Journal of Veterinary Research 1983; 44: 1130–1132.